Bibimbap is a traditional Korean lunch dish. “Bap” means “rice”, and “bibim” means “mixed”; it’s a selection of different mini-dishes that you mix in with a bed of rice. I think I came to it through my love affair with Kimchi, although there are more and more Bibimbap places springing up around the UK. 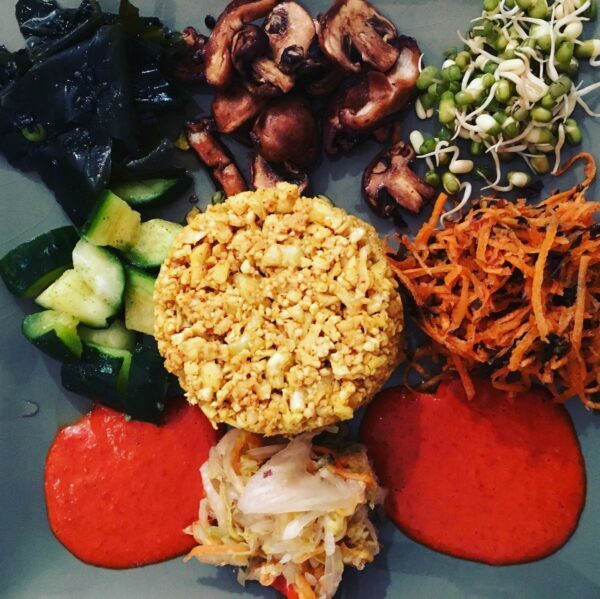 Your starter is always rice, and then the beauty of it is in the complementary elements that are placed artfully on top of the rice: carrot, cucumber, wakame, beansprouts, shiitake, and the afore-mentioned Kimchi. Although traditionally served cooked, this is a dish crying out for a raw version! And it’s so Instagram ready, with the rainbow of contrasting colours from the different toppings. Authentic Bibimbap may contain beef, but we can omit that; there’s also usually a fried egg on the top, and I have thought about including half an avo, but the dish is so substantial in itself, there’s no real need for that extra protein. The crowning glory of Bibimbap though, is the Gochujang sauce. Gochujang is a fermented chilli paste with a complex umami flavour. The Gochujang is served on the side, and that’s where the real fun of the dish comes in. You might be serving all the elements arranged separately on the plate, but when it comes to the eating, the idea is to do as the name suggests, and mix it all up. Make a huge big mess on the plate! The Gochujang is the magic ingredient that brings all the flavours together, and the resulting medley is so much more than the sum of its parts. I love to simplify things in my kitchen, and one way to do this is to always make more of a dish than you need in a meal, and then play around with it in a different way for the next meal. For example, I make a batch of cauliflower rice using a whole cauliflower, store it in the fridge, and one day I might use it in my Bibimbap and another in my Sushi. This dish lends itself perfectly to that mix ‘n’ match philosophy. Sure, you can take the time to assemble every element together, and create yourself a Korean feast. But if you’re in a hurry, any one or two of these toppings is still a delight; as long as you’ve got the Gochujang and the rice in there, you can’t really go wrong. Final side note: I often add kale as an extra element to this combo, although of course that’s in no way traditional. I massage kale in some sesame oil, rice vinegar, and salt, and top with a little black sesame. I guess, as kale contains more protein than beef, we could say that’s our beef substitute! Ok, let’s start with the rice. Cauliflower rice is one of the great staples of raw cuisine, so quick to do and so versatile. This is a super easy version. You really need a food processor to get the rice a good consistency; if you don’t have one, I would do it by hand. Discard the outer leaves, and break the cauliflower into florets. Put it in your machine – I would recommend doing it in four batches to get the right consistency. Break it down to the size of rice grains: if you put too much cauliflower in at once, chances are some of it will end up as a powder and some will remain in big chunks, so better to do it in batches. When it’s done, transfer it to a mixing bowl and add the other ingredients: tahini, pumpkin seed oil, salt and turmeric. Sesame oil and hemp oil work just as well in place of pumpkin seed oil if you prefer. If you don’t have Himalayan black salt (also known as Kala Namak), use any kind of rock salt, this particular salt just adds a wonderful pungent flavour that works well in this dish. Next, let’s do the other main component, the Gochujang. The Korean chilli flakes are essential for this recipe, they have the umami flavour that makes this dish sing. They should be pretty easy to pick up from an Asian supermarket, and they are not pricey. Blend the chilli flakes, garlic, rice vinegar, tamari, miso, sesame oil, water, and coconut sugar together to a medium thick paste. Scrape it out of your blender into a bowl to store. Ideally, we want the cucumbers a little fermented. Don’t buy pickles in dill, that flavour profile won’t really work in this recipe! But if you have a favourite brand of pickles without herbs, you can use those. Or if you have time, make the cucumbers a day ahead of time, to allow them to ferment a little. Chop the cucumber into small chunks, toss it in the salt and kelp, and press it into a small clean jam jar. Leave it at room temperature overnight and the fermentation process should begin. Failing either of those options, just use less salt and serve the cucumbers straight up and crunchy. The wakame also needs a little pre-prep. Cut it into small pieces with scissors (really small, cos wakame can be a bit chewy), and soak it for at least an hour. Drain it really well, and add the black sesame seeds, liquid aminos, and oil. The rest is simple. For the carrot salad, grate the carrots, then toss them in the dulse flakes and liquid aminos. For the shiitake mushrooms, fine slice them, and then marinate them in the tamari; they will soak it up in a matter of minutes. For mung bean sprouts, I use the ones from the health food store, rather than the long Asian ones found in supermarkets, which lack nutrition. 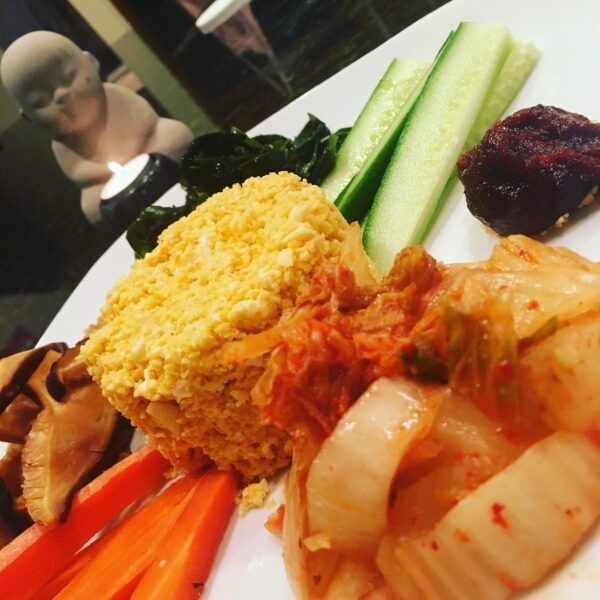 For the kimchi, at some point you need to check out my pretty awesome recipe here, but if you haven’t got time for that now, buy a jar, preferably from a health store. If you shop in an Asian supermarket and you’re vegan, make sure it hasn’t got fish sauce in, most of the commercial brands do. If you’re shopping in a health store, make sure it’s actual kimchi you’re buying with its stunning colour and flavour, not just a jar of imitation spicy cabbage. There you go! All your elements assembled. Here comes the fun part. You want to start with a cup of rice on each plate. Sometimes I serve it with the rice in the centre, and the coloured vegetables make a circle around it, other times I flatten out the rice on the plate and arrange the rainbow over the top. Your choice. 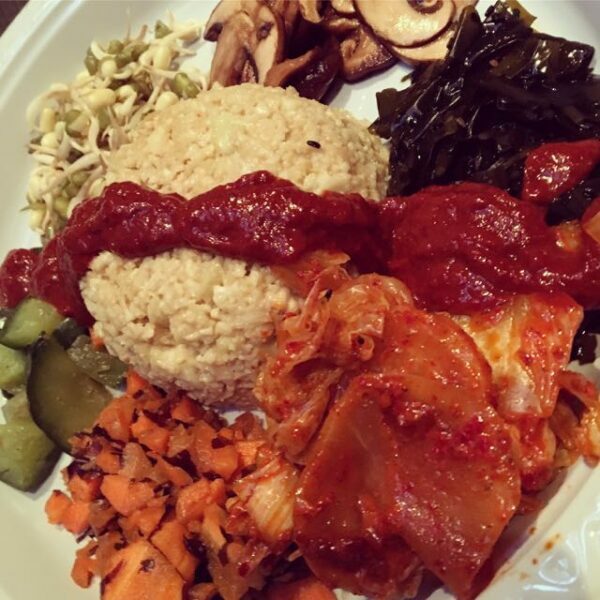 Then take a little of each element: carrots, cucumber, mushroom, kimchi, wakame, bean sprouts, and add to your plate. You need smaller amounts than you might think, because the whole thing is very filling. Don’t be scared of having leftovers that you can eat the next day, rather than putting too much on a plate and ending up scraping it into the bin because someone has a full belly. Lastly, the piece de resistance, the Gochujang.Sometimes, I dribble it over the top of the rice, other times I put a lil dollop on the side. Again, use less than you might imagine, as it’s very spicy. You can always serve some extra on the table for those who want to up the heat. Your Korean feast is ready. If you’re serving it for guests, make sure you instruct them to mess up your beautiful work of art before they eat it, because it really does taste ten times better when everything gets alchemized into one. And remember, if it all seems a bit laborious for you, I urge you to start with the rice and Gochujang, and see if that doesn’t hook you into the wonderful world of Bibimbap.